Why should this be ‘depressing’? Those who believe the Bible should be elated—after all, the earth was created first (before the sun, moon and stars) and was specially designed to accommodate millions of kinds of living things. Earth stands unique in all the planetary bodies yet discovered. Its distance from the sun, temperature range allowing liquid water, and diverse range of organic life, point to an Intelligent Designer who created the world as an ideal place for life. That is, according to evolutionists, the solar system was born in a collapsing cloud of dust and gas called a nebula, hence the term nebular hypothesis. Most of this collapsed into the sun,2 while the inner planets were formed from fragments that collided and fused together. The more scientists have investigated this, the more they have realized that there is a problem. 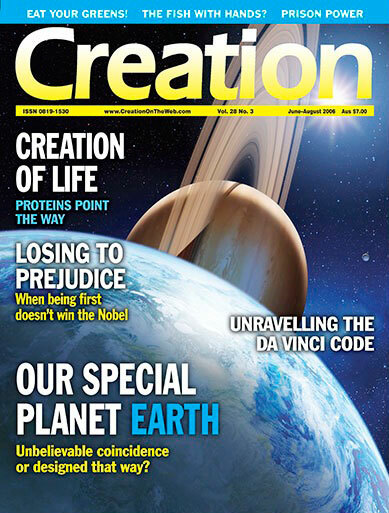 However, Dr Clarke couldn’t bear the thought of Earth being in a favoured place in the universe, even in an evolutionary scenario, as shown in the quote at the beginning of this article. It has a great deal to do with the humanistic/atheistic belief that life on Earth, including humanity, just ‘happened’. Therefore they would expect our earth to be neither especially equipped nor to occupy a special location in the universe. So he prefers the above ‘speculative’1 idea! 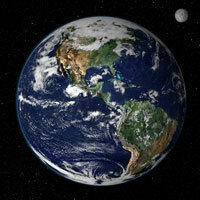 Of course, there is nothing depressing about God creating Earth especially for life, as the Bible says! The genuine scientific evidence, as opposed to unscientific assumptions, is just another confirmation that nothing in real science contradicts the Bible—on the contrary it confirms the Bible’s history over and over again. Earth was a freak, New Scientist 177(2388):24, 29 March 2003. Return to Text. With a major problem that the planets have most of the solar system’s angular momentum—see Spencer, W., Revelations in the Solar System, Creation 19(3):26–29, 1997. Return to Text. Sarfati, J., Our steady sun: a problem for billions of years, Creation 26(3):52–53, 2004; Faulkner, D., The young faint sun paradox and the age of the solar system, Journal of Creation 15(2):3–4, 2001. Return to Text. Not to be confused with the notion of an infinite universe, which most big-bangers reject. The two-dimensional surface of a balloon is also finite, despite having neither centre nor edge. Return to Text. Even Edwin Hubble, the discoverer of the expansion of the universe, admitted ‘Such a condition [these redshifts] would imply that we occupy a unique position in the universe …. But the unwelcome supposition of a favored location must be avoided at all costs. … is intolerable; moreover, it represents a discrepancy with the theory because the theory postulates homogeneity.’ The Observational Approach to Cosmology, Clarendon, Oxford, pp. 50, 51 and 59, 1937. Return to Text. This refers to regular ‘spacings’ in the ‘shift’ in the frequency (hence colour) of their light, and hence the distances assigned to faraway galaxies. See Humphreys, R., Our galaxy is the centre of the universe, ‘quantized’ redshifts show, Journal of Creation 16(2):95–104, 2002. Return to Text.